With Rob Cowan. Including Musical challenge; Music in Time: Renaissance; Artist of the Week: Georg Solti, featured conducting the conclusion of Wagner's Das Rheingold. Take part in today's musical challenge: trace the classical theme behind a track from the world of pop music. 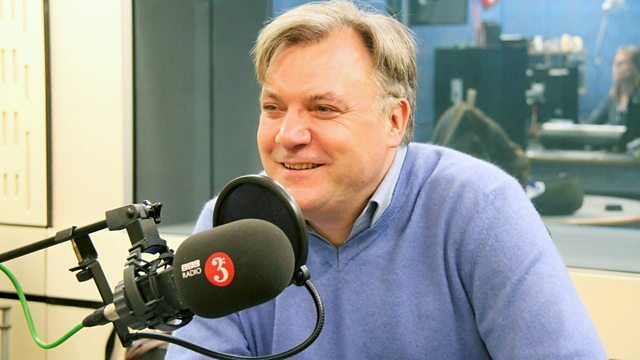 Rob's guest this week is the former front-bench politician, Ed Balls. After leaving a promising career in journalism, Ed became a Labour MP in 2005. He went on to be Secretary of State for Children, Schools and Families under Gordon Brown and Shadow Chancellor under Ed Miliband. Since leaving politics Ed has found fame as a dancer on Strictly Come Dancing (remaining in the competition much longer than most expected!) and he's recently brought out an autobiography, Speaking Out, a record of a life in politics and a window into the world of Westminster. He played the violin for 15 years and in adult life became a keen pianist, working publicly through grade exams and other performance milestones. Throughout the week Ed will be sharing some of his favourite classical music, including pieces by Handel, Bruch and George Dyson. Today, Rob's in the Renaissance period, exploring collections of music published in the late 1500s for performance during the season of the Venice Carnival. Rob explores the nature of performance by highlighting the differences in style between two recordings of a piano piece by Chopin. Rob's artist of the week is the conductor Sir Georg Solti. Solti was one of the twentieth century's leading musicians, leaving a vast legacy of over 250 studio recordings, including 45 complete operas. Born in Hungary he studied under Béla Bartók and worked at the Hungarian State Opera as a répétiteur. After leading a number of German opera houses, Solti took the helm at London's Covent Garden and was later director of the Chicago Symphony Orchestra and the London Philharmonic Orchestra. In the 1950s and early 1960s Solti was a powerhouse rostrum presence, as the rather melodramatic photos of him in action would suggest, but a good deal more than that. Solti could bring gravitas to Beethoven, warmth to Mendelssohn, and a dramatic impulse to Wagner, adapting his approach to suit the style and mood of the music. Throughout the week Rob shares recordings from early in Solti's career including symphonies by Mendelssohn, Beethoven, Mahler, ballet by Offenbach and the conclusion to Wagner's Das Rheingold. Orchestra: Vienna Philharmonic. Conductor: Herbert von Karajan. Orchestra: The Hanover Band. Conductor: Roy Goodman. Music Arranger: Percy Grainger. Orchestra: City of Birmingham Symphony Orchestra. Conductor: Sir Simon Rattle. Overture from the British Isles, Vol.2. Henry Purcell The Complete Fantazias Fretwork. Conductor: Georg Solti. Singer: Kirsten Flagstad. Singer: Claire Watson. Singer: Oda Balsborg. Singer: Jean Madeira. Singer: Hetty Plümacher. Singer: Waldemar Kmentt. Singer: Set Svanholm. Singer: George London. Singer: Kurt Böhme. Singer: Walter Kreppel. Orchestra: Vienna Philharmonic. The answer to today's challenge was Johannes Brahms, whose Hungarian dance No.5 provided the tune for 'Rap City' by the Ventures.